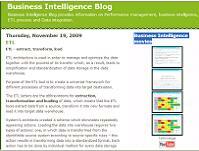 Details: Business Intelligence and Data Integration blog provides information on Performance management, business intelligence, ETL process and Data integration in a data warehouse environment of an organization. There is a Business Intelligence movies section with video tutorials on the most popular tools. The blog posts cover such topics as ETL, EII, Data Integration and Business Intelligence.